Pakuranga College Year 9 student Ella Crowe has ranked first in New Zealand-in her age group at the New Zealand Junior Swimming Festival. The festival is run in four regions and medals awarded to New Zealand’s top junior swimmers. 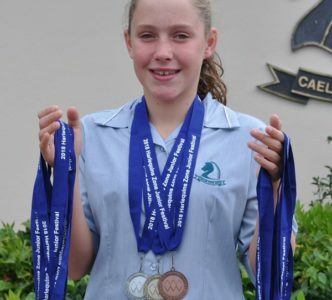 Ella took home four golds, three silvers and three bronze medals making her the top ranked swimmer in the Auckland zone in her age group. Ella trains exceptionally hard with eight sessions a week at two hours per session. Her favourite discipline is freestyle and her ultimate dream is to compete at the Olympics.